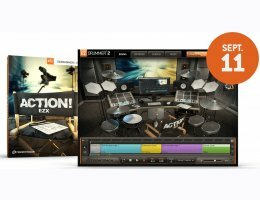 The Action EZX presents a fusion of orchestral percussion, sound effects, custom foley and classic drum machine sounds, designed for use in any creative context where beat, groove and tone are allowed to transcend the traditional confines. In addition to classic orchestral instruments like timpani, tamtam and timbale, it also captures one-of-a-kind foley, risers, claps, snaps, drops and layered textures of sound never before heard – all intuitively blended, mixed, matched and saturated with various effects in creative hybrid kits. All in all, in excess of 250 individual percussive sounds are presented and used in the more than 21 mix-ready kit configurations included.